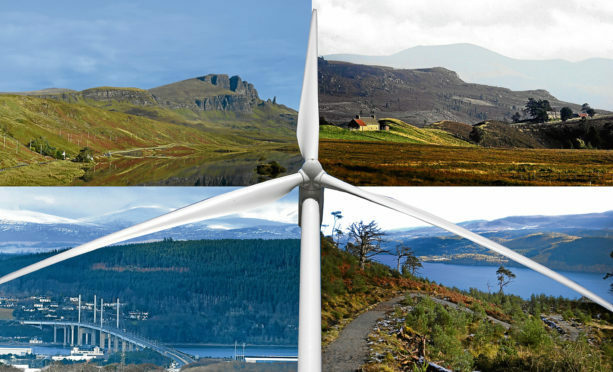 MONTAGE for windfarm story - clockwise from top left: Old Man Of Storr on Skye, Dava Moor, The Great Glen Way and The Black Isle. A UK Government consultation launched last December sought to change the definition of remote island wind-energy in order that it might compete with larger developments. While having enormous potential for electricity generation, thanks to strong winds, as well as new jobs and work for local suppliers, island windfarms face higher costs due to their location and transmission requirements. According to the government, whose consultation runs until March 8, this makes them different from other onshore projects and suitable, therefore, for its CfD auctions. Under the CfD scheme, qualifying projects are guaranteed a minimum price at which they can sell their electricity. The Department for Business, Energy and Industrial Strategy (Beis) has confirmed that bureaucrats in Brussels have no objections to the proposed change, suggesting there would be no breach of EU state aid rules. Many people in Scotland’s remoter communities see renewable energy as vital to their economic and clean energy future. A number of planned wind projects on Orkney, Shetland and the Western Isles totalling 750 megawatts are now a step closer to being eligible to compete in the third CfD auction round. Highlands and Islands Enterprise energy director Audrey Maciver said: “HIE, along with Shetland Islands Council, Orkney Islands Council and Comhairle nan Eilean Siar (Western Isles Council) have long pressed for a means by which efficient, cost-effective renewable electricity generation can be exported to the mainland electricity system, recognising the fantastic wind, wave and tidal resources of these islands. “In doing so, significant economic and social benefits will be realised not only on the islands but across Scotland and the UK. A UK Government spokesman said: “We welcome the decision from the European Commission not to raise any objections to the government’s proposal on remote island wind. The new proposal seeks to have island wind projects looked at as separate and distinct technology, allowing them to compete in CfD auctions for the first time. These projects would also set their own strike prices, separate from the UK.